This easy handwriting trick uses an item you probably have in the workshop or garage of your house. Sometimes, a creative technique is all it takes to help kids work on letter formation and line awareness in their handwriting. We used sand paper to provide proprioceptive feedback through the pencil while working on handwriting skills that might be difficult for some kids on regular paper. This trick is a fun pencil control activity that is helpful for improving handwriting. Scroll to the bottom to watch this Sandpaper Handwriting Trick. Sandpaper might be considered a super tool in the Occupational Therapist's therapy bag. It's a great medium for working on handwriting in several areas: Using sandpaper as a base sheet when writing provides a surface for feedback through the hand. This is one easy way to help kids who need to work on pencil pressure. Read more about helping kids to write with appropriate pencil pressure. This is such an easy trick for helping kids to work on letter formation, number formation, letter reversals, and organizational issues such as line placement (aka writing on the lines and in the spaces on worksheets). All you need is a single sheet of sandpaper. With kids, sometimes a small twist on what you've been doing is all that you need to get the hours of practice to finally "stick". You might have been working on letter or number formation over and over again in a bunch of different ways. 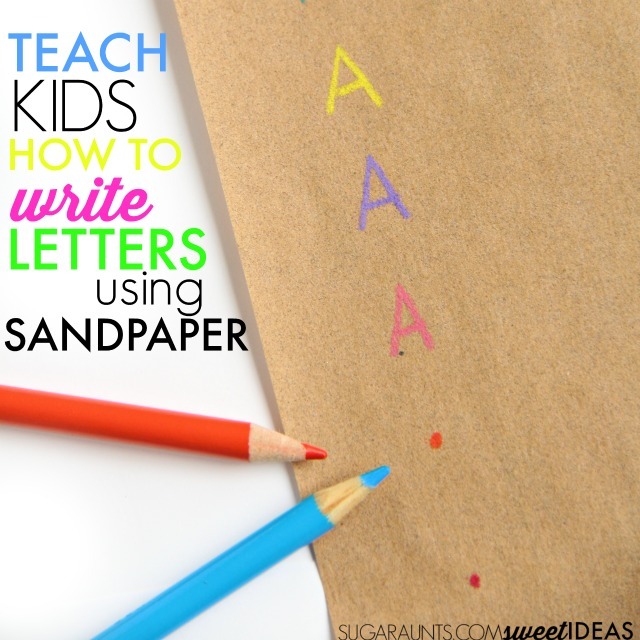 The chalkboard, the white board, the fun pencil, writing in the sand bin...but give the kiddo a piece of paper and the letters are choppy, poorly formed, and all over the lines. What is a mom/teacher/OT to do? Some kids respond well to repetition. Motor planning is a good thing when it comes to letter formation or number formation! However, other kids work well with all of the tricks but just can't carryover the skills they've learned once they are required to write quickly or write an open-ended response (aka think while writing). 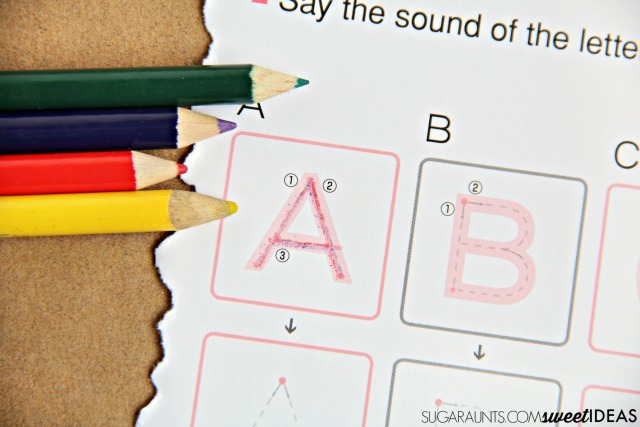 This sandpaper writing trick is one strategy that can help kids slow down, respond to tactile sensory input, and modify their pencil control given proprioceptive feedback. Simply lay a piece of paper on top of a sheet of sandpaper. And then write. 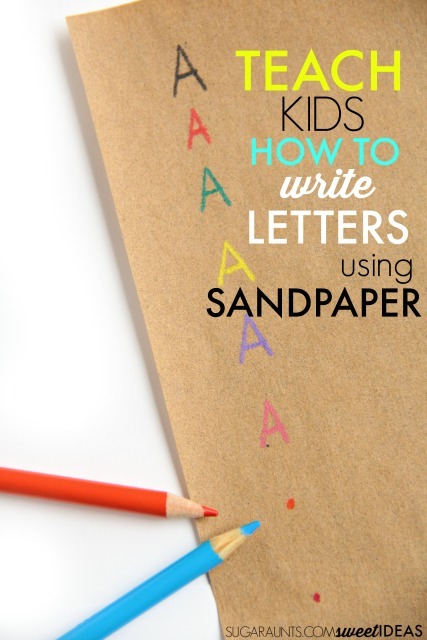 The sandy grit of sandpaper provides feedback through the pencil and allows kids to slow down, write with better pencil pressure, and be more aware of how their pencil is moving in the space they have to write in. Sandpaper provides a great proprioceptive strategy for handwriting. Different kids will respond to different grades of sandpaper. This pack comes in an assortment of grades so that you can try more or less "sandiness" to the paper. A coarse grit will provide more feedback and a fine grit will provide less sensory input. Watch the video to get a better understanding of how to complete this activity. Show it to the kiddos, too! This is a great trick to use with workbooks. 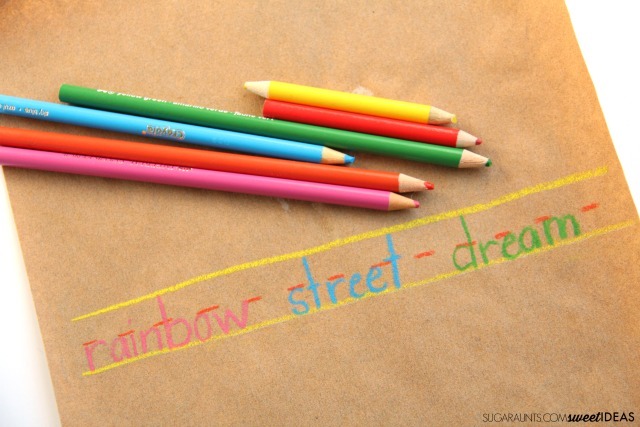 Use several colors of colored pencils to practice letter or number formation with rainbow writing. Simply trace over the letters with different colors to practice letter formation. Using a sheet of sandpaper under a worksheet can allow for improved placement in a writing space by encouraging the child to slow down while writing. 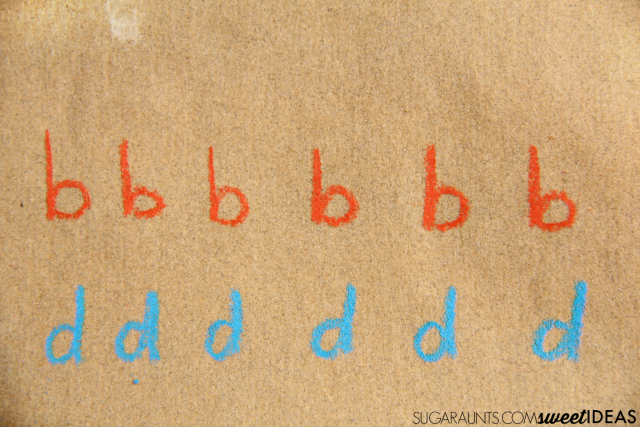 Try writing right on the sandpaper with colored pencils to really add a tactile strategy to letter formation. Try placing starting dots along with verbal or visual cues to form the letter correctly. The tactile feedback will add a "memory" to forming the letter. This is a great strategy for helping kids to address letter reversals. One last way to use sandpaper in handwriting is to draw lines on the sandpaper and ask the child to write on the lines with colored pencils. While this is not a practical strategy for written work, it's a great way to practice line awareness and spatial organization skills. Once the sandpaper is filled up with writing, use it as a base for placing paper on top. Try using these Pencil Mazes over the sandpaper to work on pencil control. Like this handwriting tip? Try all of the strategies in our Easy Quick Fixes to Better Handwriting series. Be sure to check out all of the easy handwriting tips in this month's series and stop back often to see them all.